Protesters rally outside the Supreme Court during the March for Life on Jan. 25, 2013, in Washington, D.C.
"The two states that stand out is where we are now able to stop bad legislation from happening," says Mary Spaulding Balch, state legislative director of the National Right to Life Committee. "It looks like we have a pro-life majority in the Senate in the state of New York, which could prevent a bill that Gov. Cuomo was pushing that would have expanded abortion in New York, if you can imagine." The same political calculus goes for Washington state, Balch says. Then there's Tennessee, where a new constitutional amendment denies any right to abortion. That's expected to clear the way for a string of regulations courts previously had struck down. The National Right to Life Committee also plans to push for abortion bans after 20 weeks of pregnancy. Nine states already do this, and Balch sees better chances for passage this year in West Virginia, Wisconsin and South Carolina. The legislation is based on the medically contested assertion that fetuses feel pain at 20 weeks. "I think what we're trying to do is keep the baby in the debate. Oftentimes the debate is focused on the woman, and I think that the baby is an equally important factor," Balch says. Nancy Northup, who heads the Center for Reproductive Rights, says courts in two states have blocked the 20-week ban. "Fortunately, many of the most extreme laws that have been passed have been found unconstitutional by the courts, and we have been able to block them," Northup says. Judges have also struck down laws restricting medication that induces abortion, requiring doctors who perform abortions to have admitting privileges at local hospitals, and forcing doctors to show women a sonogram of the fetus. 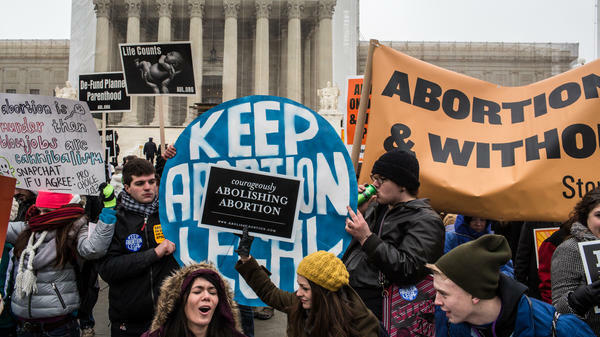 Supporters of the laws say they are meant to protect women's health, even though a recent study finds serious complications occur in far less than 1 percent of abortions. "Courts have recognized that these by and large are sham laws that are designed to make it difficult for women to have abortions," Northup says. "They don't serve any medical necessity, and the courts have seen through that." Still, some laws have been allowed to stand, including a number that require stricter building codes for clinics that provide abortion. That has pushed dozens of clinics across the country to close. "There are great swaths of the state of Texas where there is virtually no access to full reproductive health care," says Cecile Richards, president of the Planned Parenthood Federation of America. "What we're trying to avoid, though, is getting to a place in this country — which unfortunately we more and more are — where it's very, very different depending on which state you live in." Different, in part, because appeals courts across the country have disagreed, letting laws stand in some places, striking their counterparts down in others. That's because the Supreme Court wasn't very clear two decades ago when it loosened the standard for regulating abortion, according to Dan McConchie, vice president of government affairs for Americans United for Life. "They changed that standard to undue burden, which became this muddled, undefined standard saying, 'OK, you can regulate it, but you can't regulate it too much,' " McConchie says. This coming year, the Supreme Court will likely get the chance to weigh in again on how much abortion regulation is too much. The new year is expected to bring another round of state laws to restrict abortion. Also in 2015, a legal battle over many of those laws may reach the Supreme Court. NPR's Jennifer Ludden reports. JENNIFER LUDDEN, BYLINE: The ongoing spike in abortion laws started after 2010, when Republicans won big in midterms. Since then, state lawmakers have passed more than 200 abortion regulations - more than in the entire decade before. Now with more state House gains in last fall's elections, abortion opponents expect another good year. MARY SPAULDING BALCH: In my mind, the two states that stand out is where we are able now to stop bad legislation from happening. LUDDEN: Mary Spaulding Balch is with the National Right to Life Committee. BALCH: It looks like we have pro-life majority in the Senate in the state of New York, which could prevent a bill that Governor Cuomo was pushing that would have expanded abortion in New York, if you can imagine. LUDDEN: The same political calculus goes for Washington state, she says. Then there's Tennessee, where new constitutional amendment denies any right to abortion. That's expected to clear the way for a string of new regulations courts had struck down. The National Right to Life Committee also plans to push for abortion bans after 20 weeks of pregnancy. Nine states already do this, and Balch sees better chances for passage this year in West Virginia, Wisconsin and South Carolina. The legislation is based on the medically contested assertion that fetuses feel pain at 20 weeks. BALCH: I think what we're trying to do is to keep the baby in the debate. Oftentimes the debate is focused on the woman, and I think that the baby is an equally important factor. NANCY NORTHUP: Fortunately, many of the most extreme laws that have been passed have been found unconstitutional by the courts. And we have been able to block them. LUDDEN: Nancy Northup heads the Center for Reproductive Rights. She says courts in two states have blocked the 20-week ban. Judges have also struck down laws restricting medication that induces abortion, requiring doctors who perform abortions to have admitting privileges at local hospitals and forcing doctors to show women a sonogram of their fetus. NORTHUP: Courts have recognized that these, by-and-large, are sham laws that are designed to make it difficult for women to have abortions. They don't serve any medical necessity. And the courts have seen through that. LUDDEN: Still, some laws have been allowed to stand, including a number that requires stricter building codes for clinics that provide abortion. That's pushed dozens of clinics across the country to close. CECILE RICHARDS: There are great swaths of the state of Texas where there is virtually no access to full reproductive health care. LUDDEN: Cecile Richards heads the Planned Parenthood Federation of America. RICHARDS: And what we are trying to avoid, though, is getting to a place in this country - which unfortunately we more and more are - where it's very, very different depending on what state you live in. LUDDEN: Different in part because appeals courts across the country have disagreed, letting laws stand in some places, striking them down in others. Dan McConchie of Americans United for Life says that's because the U.S. Supreme Court wasn't very clear two decades ago when it loosened the standard for regulating abortion. DAN MCCONCHIE: They changed that standard to undue burden, which became this muddled, undefined standard, saying, OK, you can regulate it, but you can't regulate it too much. LUDDEN: This coming year, the Supreme Court will likely get the chance to weigh in again on how much abortion regulation is too much. Jennifer Ludden, NPR News, Washington. Transcript provided by NPR, Copyright NPR.